Four years ago, on January 21, 2001, I penned an article entitled “Taiwan Independence, R.I.P.” In it I made both an assessment and a prediction. Four days ago, on March 25, 2005, my assessment was confirmed and my prediction came true. Now affirmations such as this are not uncommon. They are nothing that Wang Yung-ching of the Formosa Group, Chang Yung-fa of the Evergreen Group, Stan Shih of the Acer Group, or Morris Chang of Taiwan Semiconductor hasn’t repeated a hundred times in the five years since Chen Shui-bian first became president. But Hsu Wen-long isn’t Wang Yung-ching, Chang Yung-fa, Stan Shih, or Morris Chang. Hsu Wen-long is the Taiwan independence movement’s most ardent supporter and most generous benefactor. 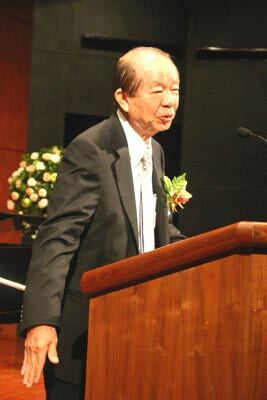 According to Forbes magazine, Hsu is the sixth wealthiest man on Taiwan. Everybody who is anybody within the Pan Green camp, anyone of any stature within the DPP and TSU, has been on the receiving end of Hsu’s contributions. Chi Mei Hospital in Tainan, one of Hsu Wen-long’s many diversified holdings, was where Chen Shui-bian arranged to have himself “treated” as part of his artificially staged Wag the Dog “assassination attempt” in 2004. Hsu was almost certainly a co-conspirator. In short, Hsu Wen-long is the worst sort of Japanophile Quisling, Taiwan independence True Believer. The timing of Hsu’s public statement, on the eve of a major anti-China protest march organized by the Pan Green camp, was clearly intended to sabotage the pro independence media event and take the wind out of its sails. Hsu’s gesture amounted to a slap in the face of the Taiwan independence movement. In fact, “slap in the face” is too mild a term for what Hsu did. What Hsu did was stab the Taiwan independence movement in the back, in broad daylight, on the steps of the Forum. Why would Hsu do such a thing? Why would Hsu do such a thing, and how did Hsu’s fellow hardliners react? Hsu’s utterly unexpected, deeply embarrassing public repudiation of the political ideals they long held sacred, left Pan Green leaders in disarray. Stunned DPP and TSU spokesmen, usually so quick to heap abuse on anyone who deviated one iota from quasi-religious Taiwan independence orthodoxy, found themselves speechless and paralyzed. Pan Green hardliners, almost all of whom were beneficiaries of Hsu’s largesse, and more importantly, who hoped to remain beneficiaries of Hsu’s largesse, not only did not criticize him, they made up absurdly laughable excuses for his actions. Some claimed that Hsu’s letter was a forgery. Others claimed that Hsu’s family members were being held hostage. Still others claimed that Hsu’s letter was drafted by Beijing and Hsu was forced to put his signature on it. The truth is far simpler, but far more difficult for Hsu’s erstwhile comrades to accept. Hsu did it because he no longer saw any percentage in the Taiwan independence movement. After 17 years of patiently “listening to what they say, watching what they do,” Beijing decided it was no longer willing to put up with Taiwan independence Quislings earning immense profits from their investments on the Chinese mainland, then channeling them into a treasonous secessionist movement committed to demonizing the Chinese people and dividing the Chinese nation. A fed-up Beijing gave Hsu an ultimatum. He could have his cake, or he could eat it, but he couldn’t do both. If Hsu hated his fellow countrymen so much he was not even willing to acknowledge he was Chinese; If Hsu hated his own country so much he was willing to deliver it back into the hands of Japanese colonialists, then he could take his business elsewhere. So-called “Tai Shang” (Taiwan businessmen) were being accorded preferential treatment on the basis that they were fellow countrymen, fellow Chinese. If Pan Green Tai Shang insisted on defining themselves as “Taiwanese, not Chinese,” if they insisted on treating the mainland as an “alien nation,” even an “enemy nation,” should patriotic Chinese continue treating them as fellow countrymen and giving them the red carpet treatment? Hsu considered his options, long and hard. He considered the fact that Taiwan’s pro independence political leaders, every last one of them, from Lee “Moses” Teng-hui to Chen “Joshua” Shui-bian, were gutless windbags, all talk and no action, who would never declare independence unless they were 100% certain the US would do all the fighting for them. He considered the fact that given Pan Green leaders’ universal failure to walk the walk, those left twisting in the wind would be hapless Tai Shang like himself who were struggling against all odds to save their individual companies and the island’s economy. He considered all that, and arrived at a decision. Like veteran gunfighter William Munny in Clint Eastwood’s Oscar-winning western “Unforgiven,” Beijing fired on the best shot first, taking out Hsu Wen-long, the hardest of the hardliners, the greenest of the Pan Greens, the Taiwan independence nomenklatura’s counterpart to the villainous Little Bill Daggett. It is important to realize something. The impact of Hsu’s bombshell is not confined to one man and one company, to Hsu Wen-long and the Chi Mei Corporation. Hsu’s high-profile repudiation of Taiwan independence has wounded the movement in the heart. Demoralization among True Believers is just beginning to set in. Political damage is going to be far-reaching and eventually fatal. March 25, 2005 may well mark the Beginning of the End of the Taiwan independence movement. Below is the very first news story posted on Hsu Wen-long’s newspaper interview and open letter. I have translated it into English for the benefit of English speakers, including Chinese Americans who don’t read Chinese. Chi Mei Corporation founder Hsu Wen-long yesterday (March 25, 2005) expressed the opinion that Taiwan and the mainland were both part of China. Chinese Communist Party State Chairman Hu Jintao’s recent speeches and the mainland’s passage of the “National Anti-Secession Law” allowed him to breath a sigh of relief, because the reason Chi Mei dared to invest on the mainland in the first place was that it didn’t promote Taiwan independence. Because it didn’t promote Taiwan independence, he believed Chi Mei’s development on the mainland would prosper. Hsu Wen-long has been retired for nearly a year. Yesterday for the first time he granted an exclusive newspaper interview and published an open letter expressing his views on cross-straits relations. He hoped to strengthen cross-straits relations, benefit both sides of the strait, and help Chi Mei enjoy greater prosperity. Since President Chen Shui-bian will be participating in today’s “326 Democracy, Peace, Protect Taiwan” parade, Hsu Wen-long’s revelations may touch a sensitive nerve in many quarters. Hsu Wen-long came straight to the point with his “One China” concept. His open letter said “I am a businessman, born in Taiwan, my ancestral home is Haichen County, in Fujian Province. In 1991 I went to the mainland to seek out my roots. I consider both Taiwan and the mainland to be part of one China, and people on both sides of the Taiwan Strait to be compatriots and brethern.” In his article he also mentioned that if people on both sides of the strait are happy, that is China’s good fortune. Hsu stressed that during the 2000 Taiwan election, when he supported the Democratic Progressive Party and Chen Shui-bian, he was not supporting Taiwan independence, but expressing his dissatisfaction with the Kuomintang’s black gold politics. Taiwan’s economic development cannot be detached from the mainland’s. Promoting Taiwan independence will only lead Taiwan to the brink of war. Regarding Taiwan’s political situation, Hsu Wen-long also demonstrated his determination to withdraw from politics in deeds as well as words. He said that earlier this year he twice tried to resign from his position as administration political consultant, revealing his utter lack of interest in Taiwan politics.